The Council’s Legislative Day occurs every April at the Wisconsin State Capitol in Madison. In anticipation of the advocacy day and state budget decisions, we released our Legislative Priorities for 2019. The Council’s advocacy efforts involve creating strategic direction and focus, forging in-roads and making connections. The Council’s strategic decisions and limited resources mean the Council most frequently interacts with legislators who are in leadership positions connected with Council initiatives, however we cannot reach every legislator in Wisconsin. That is where you come in. It makes a big difference for legislators to hear about issues directly from their constituents. People living in the communities legislators represent can provide insight about local issues, and what everyday life is like in that community. It is important to build relationships with those who represent you, so they understand the issues and make positive changes. Every constituent has an important story to tell that could help open the mind and heart of a legislator. Your voice matters, so we encourage you to let your story be heard. There are a lot of ways to reach your legislator. You could write a letter, make a phone call or meet with them in-person. No matter the format, there are many benefits of communicating with your legislator, and the Council is happy to help you share your message. Start building a relationship and remember that it takes time; come back year after year to build rapport and always introduce yourself to newly elected officials. Introduce the legislator to the issue; give them a chance to ask questions and learn more. You will build credibility as a person with lived experience. You might be able to learn what other groups your legislator has heard from who also champion your cause. Because of your conversation, your legislator might contact the Council to learn more. Your legislator has the opportunity to take information and stories you provide into consideration when reviewing legislation. Below are tips for how to talk to a legislator or legislative staff and a few examples of how to write to your legislator. Communicate in a way that works best for you. If you are comfortable making your point by talking, then a phone call might be the most effective way to communicate with legislators. If writing is more your forte, put your thoughts down on paper. Remember that a paper letter is more effective and will get more notice than an email. If you have the chance to visit with a legislator in-person, take advantage of the opportunity. An in-person visit enables back and forth conversation and allows the legislator to ask questions in real time. You can also more easily assess how the legislator is responding to what you are saying via body language or tone of voice. Before the conversation, you might find it helpful to role-play with a family member or friend. Feel free to structure your phone call, letter or visit in a way that works for you. An example is below. Before your visit, check out the legislator’s personal webpage to learn about their background and interests. This will give you the opportunity to connect with them on a personal level during your visit. You might find you share a hobby, the love of a local sports team or something else from your community that gives you reason to build a more personal connection. At the start of your visit, introduce yourself and say why you are there, state a piece of data or statistic relevant to the topic. Say why you care. Remember that legislators are people, with families and lives, just like you. When choosing a topic, pick the things that are nearest and dearest to you because those are the things you are going to articulate the best. Pick one or two of the Council’s Legislative Priorities–trying to talk about all five would be too much. Share examples from your own life that illustrate your lived experience with this issue. Pick one or two poignant examples with sensory descriptions to make your story memorable and vivid. For example, saying, “I had to decline a job offer because there was not public transportation in the city where I wanted to work,” carries less weight than saying, “I once got a job offer in a small town and had to decline it, because if I took the job, I would have needed to walk everywhere since there is not public transportation in that town. I considered it a hardship to have to walk and get groceries in the wintertime, when it would be cold and snowy.” People remember sensory experience, so include details about sounds, smells and sights in your story. Try to keep examples down to a few sentences to avoid sharing too many details and lose the interest of the legislator. Ask questions to garner the legislator’s knowledge of an issue. Examples are: “Has anyone else approached you about this issue?” Given that knowledge, ask the legislator what they would like to focus in on during the conversation. Then they can ask follow-up questions and discuss next steps. The meeting is an opportunity for a dialogue-a back-and-forth conversation. If the legislator is providing cues that they know quite a bit already about the issue you have come to speak to them about, be ready to be flexible in order to make the best use of your time. Let the conversation flow. Give the legislator the opportunity to ask questions and share information that they have about the topic. Ask what else would assist them in building their understanding, what else would be helpful, and what they could do about the issue. a) Mention your direct experiences; talk about how you are impacted. b) Repeat your ask one more time and then pivot; shift to a different aspect of the issue or another issue you would like to cover. c) Circle back to your perspective one last time as you are closing up the meeting. Stay calm, kind and firm. Offer to follow up on any questions the legislator has that you cannot answer immediately. Board members Steve Johnson (left) and Rhonda Staats (right) stand with Senator Jennifer Schilling (center) at Legislative Day in 2018. Remember that this conversation should be a balance between talking, listening, asking and answering questions. An appointment with a legislator is approximately 30 minutes, so make the most of it. We hope that you can use this advice on Legislative Day, but also anytime you meet with a legislator in the future. 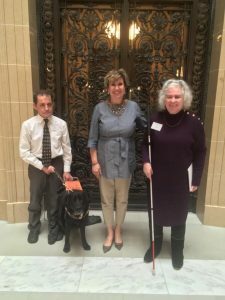 Many of the items Governor Evers listed in his budget would favorably impact people who are blind or visually impaired. Contact your state representative and senator to express support of Governor Evers’ budget. The Joint Finance Committee (JFC) is holding public hearings to get the perspectives of people who would be impacted by the budget. Attend a hearing in your area to share how the budget items impact you or a family member. Free parking at the Pay One lot, North Second St. The Council’s new Advocacy page features a Find Your Legislator link, which you type in your address and it generates a list. For discussion topic ideas, the Council’s Legislative Priorities can also be found on the Advocacy page. If you would like support to determine who to contact from that list, or what to say in a meeting with your legislator, reach out to Denise Jess, Council CEO/Executive Director. Call her at 608-237-8103, or email djess@WCBlind.org. If you come to Legislative Day, the Council will review good practices and tips for a successful one-on-one meeting. For help with writing a letter to your legislator, find a writing workshop in your area and use the resources linked below.